Stars leap and dance all over this bag, leaving trails of light in their wake. Yellow stylized shooting stars are surrounded by swirls of bright blue on a midnight blue background. Our Wide Leaping Stars! 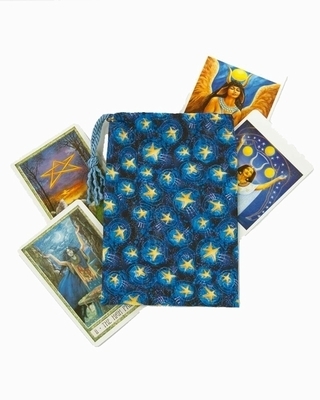 tarot bag good match for the Goddess Oracle (shown to the right of the bag), or the Druidcraft Tarot (shown to the left of the bag) as well as many other large-sized tarot or oracle decks that have dominant blue colors and lots of celestial imagery. Star Symbolism: Stars symbolize many things, but most of all they symbolize the eternal nature of the universe. Since prehistoric times, mankind has looked up to the stars and seen them as symbols of hope and aspiration. Stars have long been used also as a symbol of magic and the unknown. Bag Design: Our Wide Card Bags are a no-fuss, streamlined option for keeping your tarot and oracle decks protected. The single drawstring cord easily slips over your wrist for when you're on the go. All seams are triple stitched and the drawstring opening is reinforced. See our Quality page for more details about construction. Size: Measures about 6" wide x 8-1/2" tall (approx. 15.2 cm x 21.6 cm). Fits most card decks that are 4" by 6-1/2" and smaller. This bag size is great for oversized tarot decks (e.g., Druidcraft Tarot, Sacred Circle Tarot) and oracle decks (e.g., The Goddess Oracle, Kuan Yin Oracle, or Tuan's Lenormand Cards).